Zephyr: Winds of Change is a 1-5p cooperative game designed by Joe Mietling and Aaron Kluck, published by Portal Dragon Games. In the game, players pilot airships into dangerous territory, fighting increasingly long odds and dastardly opponents. If you are skilled enough, you’ll face off in an epic aerial dogfight with an evil Warlord of the skies!! I get pumped just writing about it. Do yourself a favor and put Beethoven’s 9th Symphony on in the background while you read this review. You know, to get you in the proper mood. 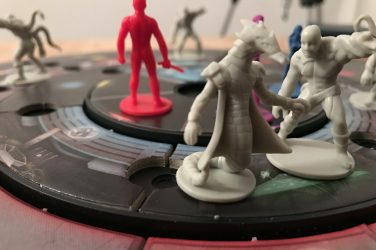 When I first requested a review copy of Zephyr from Portal Dragon (which they were gracious enough to provide me – thanks! ), they emphasized the narrative and thematic elements of the game. 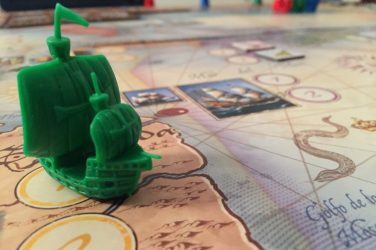 From the box art to the component design and construction, Zephyr really wants to immerse you in its world of swashbuckling air pirates, daredevil inventors, and the like. It’s a beautiful game, which I hope comes out in the included pictures. 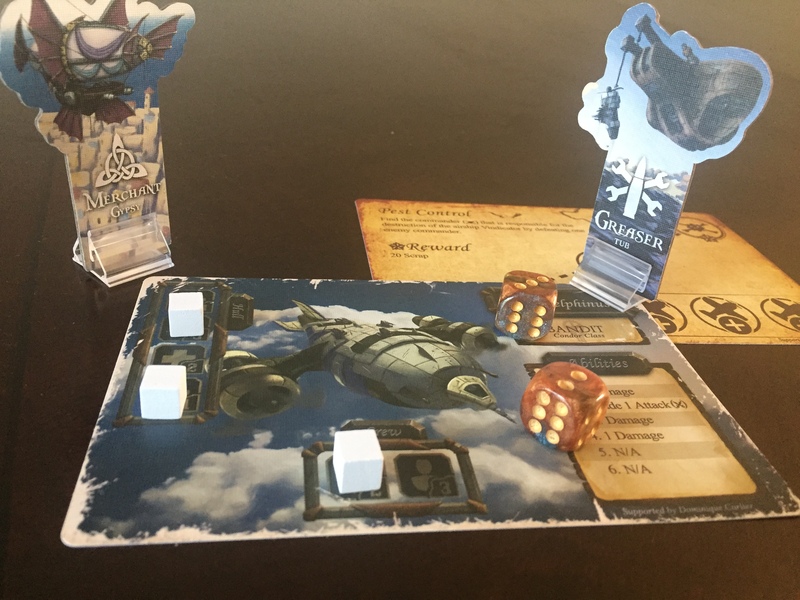 Your gameboard, which is very sturdy and functional along with being visually striking, represents your airship. The board allows you to track your health and armor (your ship’s hull), along with various upgrades to your weapons system, maneuverability, overall tech level, and also crew members which allow you to do other stuff. In addition to your player board, you also get a slender deck of cards that constitutes the main way you interact with the game. The cards allow you to pull off a bunch of simple maneuvers like firing a cannon or dodging. Along the way, you will either purchase or find better maneuvers which go both on your ship and in your deck. So, at it’s core, this game is a deckbuilder. However, I don’t want the label of “deckbuilder” to pigeonhole this game because there’s a lot more going on. Your personal deck is how you navigate the game’s combat system (I’ll get to how you actually provoke combat in a minute). 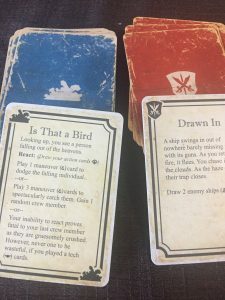 When you are facing an enemy ship, you draw between 2-5 cards from your deck (more as you get buffed, obviously) and figure out the most effective ways to play them. Do you go all out and attack? Do you go defensive and let a buddy lay in the fireworks? You get the idea. The enemy then rolls on its own chart in response, which usually represents their own attacks and dodges. All combats continue until there’s an ultimate winner which, for the sake of the safety of the skies, will hopefully be you. Aside from your personal deck, this game has a TON of other decks of cards that represent various elements of the game space. 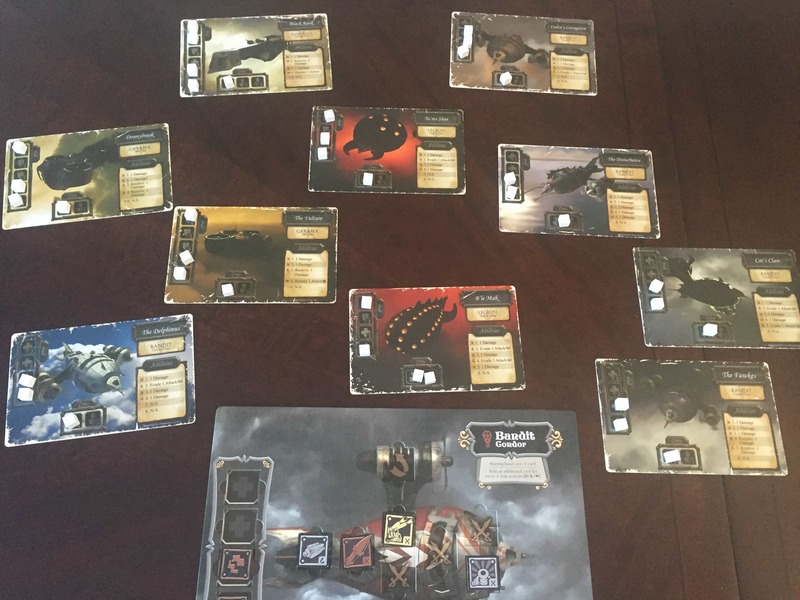 Mission cards define your overall goal; you can choose between a simple flight mission, a series of fights against bigger bad guys, and other scenarios. Mission cards also track the days you spend on a mission. The longer you spend, the harder the enemies become. Assignment cards give players sub-missions that allow everyone to earn scrap (the game’s currency) and gear up. Location cards provide global effects for the party while you are there. Upgrade and Crew cards await those who successfully complete (or escape from) assignments. Enemy airships, commanders, and Evil Warlords (!!!!) all have their own decks. Decked out, yet? Well, here are the two most important decks. 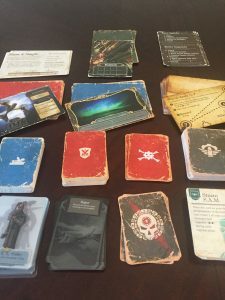 These decks provide forward momentum and narrative thrust to the whole package – the Skirmish Cards and Scavenge Cards. Every turn, players can choose to draw from either deck (if they are not otherwise occupied on an assignment). Skirmish cards usually set up a fight, while scavenge cards describe various misadventures to challenge the player. The game’s narrative elements really shine here, especially in the context of the scavenge cards. You might meet slavers along the way who offer enticing deals on potential crew. A foreign object might fall from the sky, testing your ships maneuverability. All sorts of stuff could happen. I hope you are still playing Beethoven’s 9th in the background. I need it so I could really sell you on Zephyr’s thematic elements. The art and overall graphic style of the game are both gorgeous and evocative of the steampunk theme, which is exactly what you want. 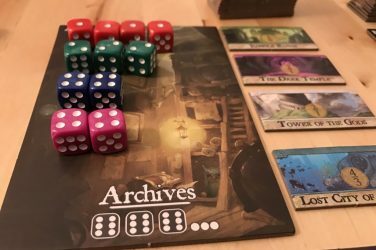 I find that good steampunk is hard to find in board gaming. A lot of “steampunk” games are like the old worker placement game Spyrium; despite whatever art is present, it still left a lot to be desired in terms of real imaginative immersion. Zephyr, however, can inspire wonderful, immersive silliness. With some cards, you simply have to read them like a 1920’s newsreel anchor. Try it, it’s fun! Zephyr has a lot of combat. In fact, I’d say an average mission would consist of at least 60- 70% combat. Probably more. Thankfully, combat is fast and smooth. The deckbuilding is simple and effective, while still allowing you to power up and execute very fun nova turns near the end. The enemies are simple to run, even when there’s a bunch of them out there at once. 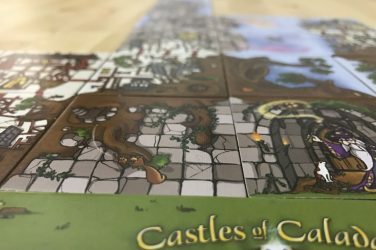 Not every big, scenario-based cooperative game can pull off. The game also provide a number of tools to adjust difficulty, which I also like. You can set up cakewalk missions to teach new players, or you can really set yourself up for some pain. Ok, you can turn the music off now. I’ve said a lot of positive things about Zephyr, and I mean them all. However, the game has a number of little issues that might hold gamers back who are not fans of the theme or coops as a whole. First of all, I found the rulebook only mildly helpful. I had to proactively seek out runthrough videos and the FAQ on BGG in order to be sure I was doing everything right. Let’s take timing of shuffling, for example. Do I get to reshuffle my whole deck after every single battle, or do I have to wait until I am off assignment which is usually after a series of battles? 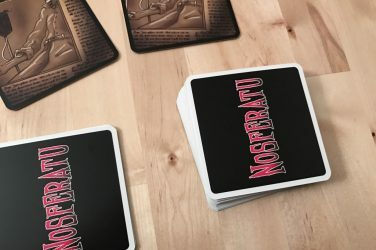 Lots of games do it differently, but the rulebook is silent one way or the other (according to the FAQ, it seems to be the latter). That’s just one example. Related to the issues with the rules are issues with lack of clarity, or just straight up typos, on the cards. 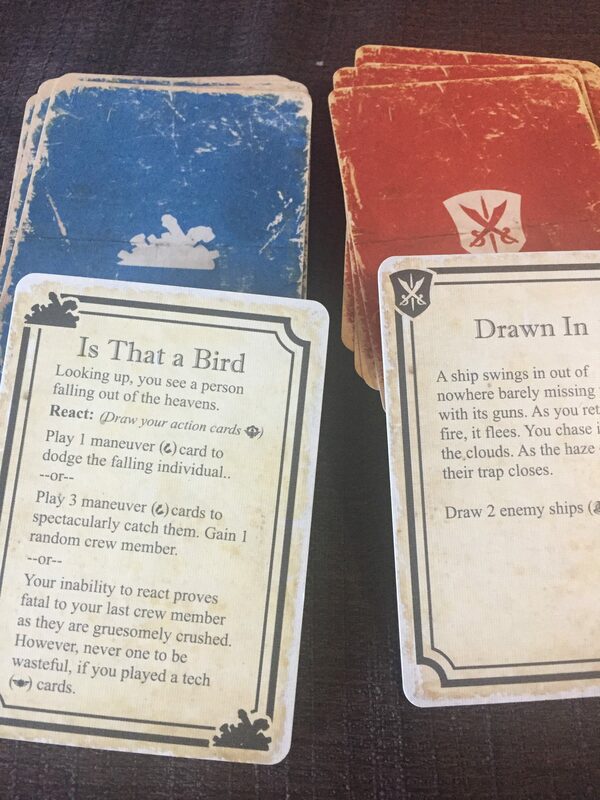 I couldn’t get a clear picture of the “Is it a Bird?” scavenge card, shown above. But if you could make out what’s there, you’ll notice that the last paragraph ends in a grammatical tangle. That one happens to be a known issue. However, there’s a more few cards like that, probably more than someone who might be on the fence about theme and/ or gameplay could tolerate. With regard to Zephyr’s gameplay as a coop and a solo, I also found some issues. For solo play, I preferred controlling two characters rather than one. That way, you can specialize ships, coordinate tactics, pull off cool combos, etc. The game has rules for one character, but it even warns that you might not do so well. Controlling one character isn’t impossible, just very difficult. As a coop, the game encourages a high degree of interaction, which is great. However, individual players can go off and do their own assignments while others occupy themselves elsewhere. This is known to D&D players as “splitting the party.” This isn’t deathly dangerous as it is in D&D However, but it sometimes encourages a player to disengage with the rest of the party for a little while. Finally, for all of my celebration of the game’s thematic elements, I think it still leaves a lot on the table. The scavenge cards are fun, but they mostly resolve in less than a minute. This sticks out because combat can take a long time. When a heavily thematic game (think Tales of the Arabian Nights, or Eldritch Horror, for example) challenges the player with non-combat events, players can often respond using an array of stats and skills. “A stranger walks up to you…” Test perception! Use your bargaining! That kind of thing. For all intents and purposes, your ship only has three stats – Strength (attack cards), Dexterity (evasion cards), and Intelligence (tech cards). I loved how some of the scavenge events test those attributes in interesting ways. However, I feel there is room for much, much more; for example, multi-step non-combat scenarios that test everyone’s skills. We’re getting into RPG territory here, I know. However, I feel a game that wants to be as heavily thematic as this one does would do well to borrow from those elements more liberally. If this BGG thread is any indication, Zephyr has a lot more story in it than it actually expressed in the context of the game itself. I really dig this game! I know I wrote more in the negatives section of this review than in the positives. However, that’s because I feel the game has a lot of potential. As it is, Zephyr provides simple and fairly smooth combat mechanics to match the high flying, adventurous theme. I don’t think Zephyr will appeal to gamers who don’t like co-op games or the steampunk theme. However, for those who do, I give it a strong play, possibly a buy. Very fun, thematic, co-op jaunt in a steampunk universe. 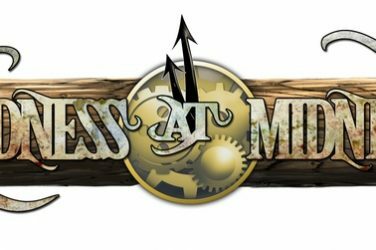 Just make sure you bookmark the FAQ page on BGG. I'm a psychotherapist by trade, practicing in CT. I play games to restore my life balance. I like thematic games with lots of narrative and story, usually cooperative but I love good thematic strategy games as well. As a game evangelist, I also like card games and anything else I can easily tote with me.